Horn yoni gauge earrings are light weight, comfortable, unique and eye-catching. 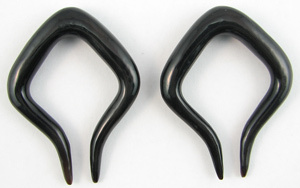 These water buffalo horn yoni hanging gauge plugs for stretched ear piercings were hand carved, rather than mass-manufactured. Approximate Dimensions: 1.25 inches tall x 1 inch wide for the smaller gauge sizes, and up to 1.75 inches tall x 1.5 inches wide on the larger gauge sizes. We normally try to get them in 8 gauge up through 00 gauge sizes. 6 gauge Select your Gauge Size and click "Add to Cart".